Morgan: I LOVE WE TRAIN ATLANTA! 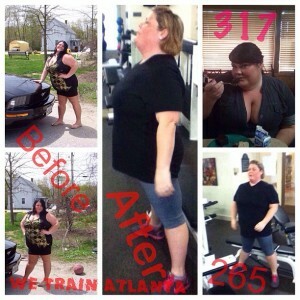 I started working out w/ Elmore McConnell in March 2012 and 6 months later I have lost 52+ POUNDS! I never thought I could do it, but Elmore is great at what he does. I truly believe he is doing exactly what the universe and God intended him to be doing with his life, HE IS THAT GOOD AT WHAT HE DOES! It’s not just a job for him, he really cares. He knows how to bring about real change in people for the better. The physical changes are just the icing on the cake for me, the real change is how he has made me rethink everything; from what I eat, how I take care of myself, and even who I am. He has shifted my perception and that has made all the difference in my weight loss journey, AND THAT IS WHY ELMORE IS THE BEST @ WHAT HE DOES, HANDS DOWN!